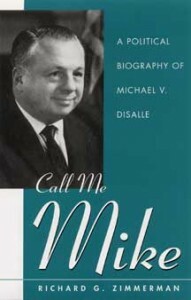 DescriptionMichael V. DiSalle was elected to his first and only term as governor in one of Ohio’s most contentious elections, which featured a ferocious battle over the so-called “Right-to-Work” issue, a union-busting constitutional amendment placed on the ballot over the objections of Republican party professionals by fanatic conservative business interests. As a result, Democrats won most statewide offices and briefly gained control of the Ohio General Assembly. During his term, which ran from his inauguration in January 1959 to January 1963, when Republican James Rhodes replaced him, DiSalle passed sorely needed tax increases, but he was less successful in his attempts to pique the conscience of Ohioans on social issues such as the poor conditions in state mental hospitals and the abolishment of capital punishment. His tours of the state’s dismal mental institutions were widely publicized, but the public showed little interest in the details concerning the warehousing of the state’s most-neglected wards. His agonizing over death-penalty cases that he was legally obligated to review alienated many in the legal and law enforcement communities. DiSalle’s private life was almost as controversial as his public life. Through-out his term as governor he was dogged by reports of his wife’s unhappiness with her role as Ohio’s First Lady and later by rumors of his romantic involvement with his personal secretary. His post-gubernatorial life was marred by several unfortunate business ventures, and like his hero, Thomas Jefferson, DiSalle seemed perpetually short of cash after he left office. Despite the controversies that plagued his career, he never stopped living a caring, passionate life. AuthorThe late Richard G. Zimmerman was a freelance writer who lived in Washington, D.C. He was bureau chief and national correspondent in Washington, D.C., for the Cleveland Plain Dealer and Ohio State-house correspondent and columnist for a chain of newspapers in Ohio. He is also the author of Plain Dealing: Ohio Politics and Journalism Viewed from the Press Gallery (The Kent State University Press, 2006).